When I was a sophomore in college I was too poor to buy Christmas gifts, so I had my grandma teach me to crochet. That year all my loved ones received poorly crafted rectangles of yarn that could barely be recognized as scarves. I’ve kept at it over the years and slowly developed a little more skill, although I still mostly stick to simple scarves and blankets. Now that our nights are getting chilly, I’ve been spending my evenings camped out in front of SVU reruns while working on crocheting projects. 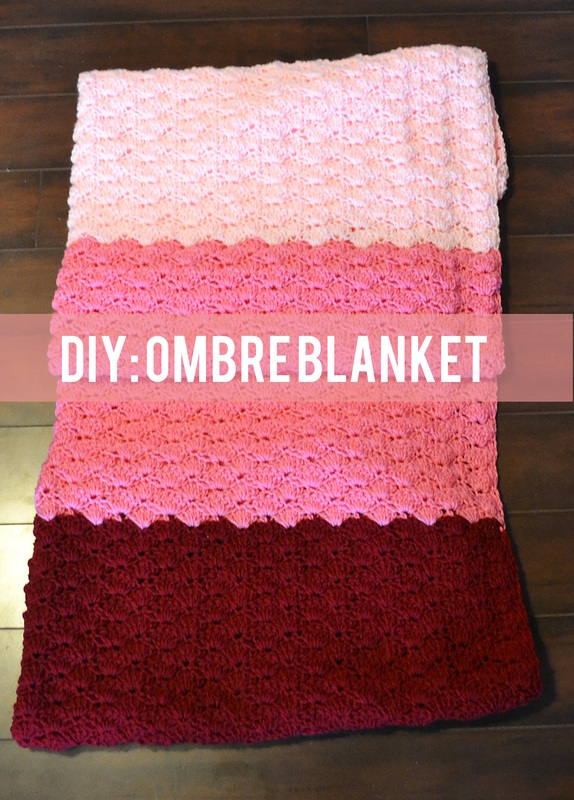 Earlier this week I completed this pink ombre blanket using a simple shell pattern. The shell is one of my favorite patterns because it looks a lot more complicated than it is – the only stitches you need to know are the single and double crochet. Starting Chain: Chain in multiples of 6 until you reach your desired length. Add two chains and turn your work. Row 1: Single crochet in second chain from hook. Skip 2 chains, and do 5 double crochets in the next chain. Skip 2 chains, and do one single crochet in the next chain. Continue across the rest of the row. Chain 2 and turn. Row 2: Do 2 double crochets in the next single crochet. Skip 2, then single crochet in the next double crochet. Skip two, and do 5 double crochets in the next single crochet. Skip 2, and single crochet in the next double crochet. Continue this pattern across. 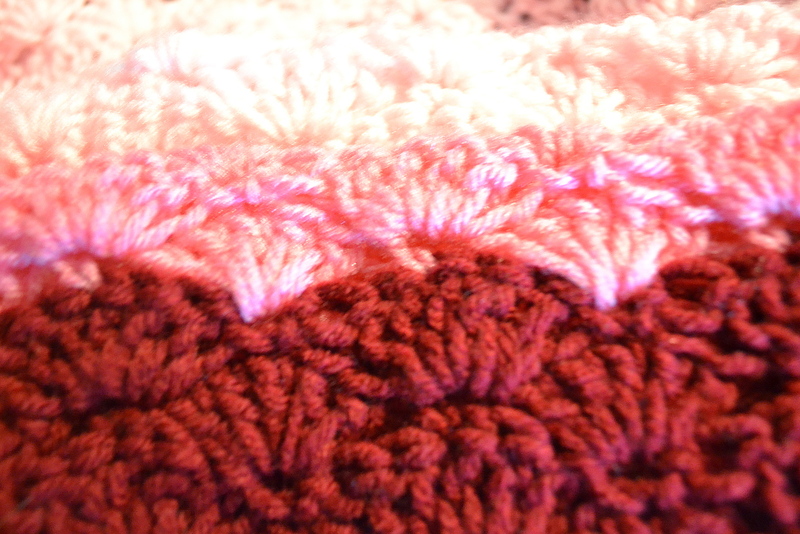 Do 3 double crochets in the last single crochet. Chain 1 and turn. Row 3: Single crochet in the next double crochet. Skip 2, and do 5 double crochets in the next single crochet. 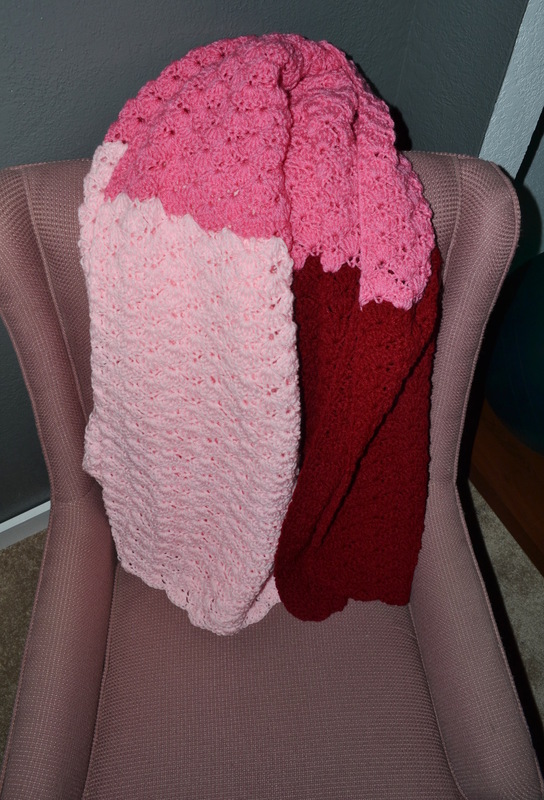 Skip two, and do a single crochet in the next double crochet. Continue this pattern across, chain 2 and turn. Repeat rows 2 and 3 until your blanket reaches your desired length. Right now this guy is hanging out on the pink armchair in the guest bedroom until the weather gets cool enough to require a lap blanket in the evenings. And in case crocheting is not your thing, I found some really pretty ombre blankets for sale here, here, and here. This entry was posted in Crafts, Pretty Things and tagged crafts, DIY on September 13, 2013 by heatherhomefaker. You should open an Etsy shop! Gorgeous!! Love the pattern and your colour choice… pinning… of course!